That was some lovely weekend. Mine started with a Friday evening visit to Shiki (translation: four seasons), the lower Queen Anne sushi bar and homestyle Japanese restaurant owned and operated by longtime Seattle sushi chef Ken Yamamoto. And it ended with the sun over the yardarm in my best friend’s backyard, where we celebrated the season by grilling a Copper River sockeye on a cedar plank. Yes, it tasted as good as it looks. I hooked this four-pounder at QFC, where whole Copper River sockeye was selling for $6.99 a pound. The June/July issue of Saveur, which I finally got down to reading, gets down and dirty with a special issue paying tribute to cooking with fire. The magazine takes a cross-country, cross-cultural look at our “BBQ Nation,” kicking off with a taste of the South courtesy of my favorite food writer, John T. Edge. The June/July issue of Saveur’s a keeper: I’d go buy one if I were you. I spent time checking out my Twitter feed for news of my professional colleagues goings on at the International Association of Culinary Professionals conference in Austin. Biggest news out of Texas? No, it wasn’t about barbecue. Not for me, at least. 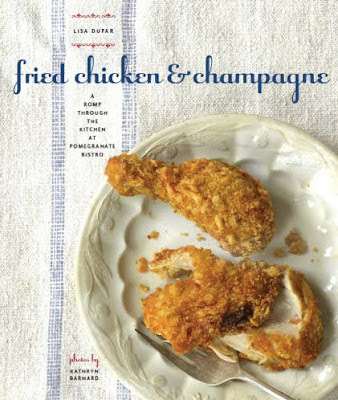 It was the big win for local chef Lisa Dupar, whose “Fried Chicken & Champagne” was a finalist for two IACP Cookbook Awards. Congrats to Lisa, for winning the Julia Child Award given to first-time cookbook authors. (Toldja so!) Here’s the full list of winners and finalists for your perusal. That cover recipe? Trust me. You want to make it. Fried chicken and Champagne may be at the top of your food pyramid, but the USDA suggests otherwise. Their changeover from food pyramid to MyPlate was big news, and over the weekend I had a chance to read what Marion Nestle had to say on the subject in her Food Politics blog. Bottom line, says she: though not perfect, with half the plate full-up with fruits and vegetables, it’s certainly new and improved. Eat your vegetables! And reduce the amount of “protein” (whatever that means). Speaking of fruits and vegetables, while strolling through my local farmers market on that sunniest of Saturdays I couldn’t help thinking about the frustration, fear and furor in Europe — and elsewhere — over the deadly E. coli outbreak. Cukes? Tomatoes? Lettuce? Sprouts? There was (and continues to be) plenty to read on the subject, including this latest update via The Seattle Times. Food-obsessed as I may be, and despite what you (and my husband) think, it’s not all food, all the time. The tastiest thing I read this weekend? Seattle author Sherman Alexie’s award-winning novel “War Dances” — finished in the quiet hour before my son woke up Sunday morning. 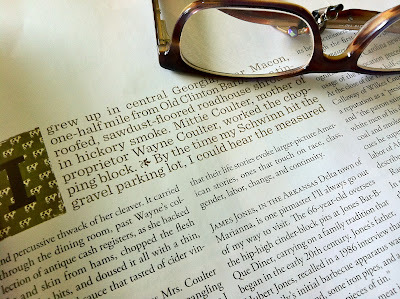 So, tell me: What have you been reading this past week? Anything I (or my Eaters) shouldn’t miss? Links much appreciated!